When talk of a wedding pops up in conversation people will usually use the words elegant, sophisticated and beautiful somewhere at some point. If we were to describe the Doyle wedding invitation from Wedding Paraphernalia we’d use exactly the same words… and a few more of the charming variety! This range is particularly eye catching because its unique laser cut doily design and the extra special diamante touches exude pure luxury. Vintage in style, the Doyle range really is the epitome of elegance. It’s also very glamorous in a classic, non-ostentatious way. 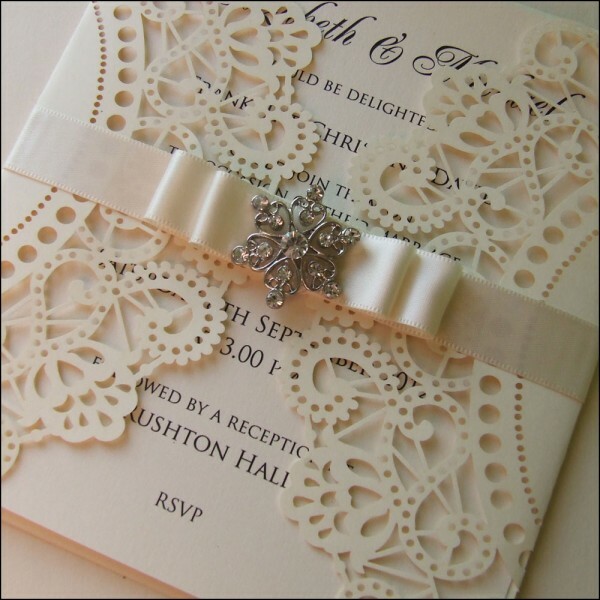 The intricate design of the doily sets the stage and acts as a ‘theatre curtain’, behind which your wedding day details patiently await to be read by its recipient. Holding the pretty doilies closed is a length of sumptuous satin ribbon which gracefully holds a stunning cluster of diamonds in the centre. You can personalise it with a specific colour to suit your theme, too! The whole effect reminds us of a wedding dress; the ribbon is a pretty belt and the doily is the vintage lace dress – simply stunning. So, imagine your guests’ opening their envelope and the looks on their faces when they see your opulent invitation in all its glory! Your odd auntie Geraldine might say ‘Ooh er, that’s posh!’ and by that she’ll mean ‘Goodness me, what a delightful invitation!’. What more could you want from an invitation? A free honeymoon you say? ‘fraid we can’t pull that one off. A small ornamental mat made of lace or paper with a lace pattern, put on a plate under cakes or other sweet food. Apparently, the word comes from from Doiley or Doyley, the name of a 17th-century London draper. The word originally denoted a woollen material used for summer wear. Whatever the correct spelling we like Wedding Paraphernalia’s name of Doyle for this wedding invitation. It sounds more sophisticated than any of the alternate spellings above and suits the elegance and charm of the design just nicely.